Aspen specializes in the design and integration of compact, vapor-compression refrigeration systems to meet challenging active thermal management in extreme conditions defined by the commercial, industrial, and military worlds. Nature dictates that heat cannot flow from a colder place to a hotter place. Vapor compression cooling uses the unique characteristics of refrigerants to do the work necessary to pump heat from low to high temperature. If your application needs performance at or below ambient temperature, Aspen Systems has the experience necessary to develop a miniature refrigeration system to meet your active thermal management requirements. Aspen can develop systems to withstand extreme environments that provide highly effective and efficient cooling with minimal hardware and operating cost. Aspen has developed standard and custom systems for a variety of applications, utilizing our own miniature rotary compressor technology. We specialize in air conditioning, chilled liquid and direct evaporation refrigeration systems. Our advanced compressor and system components, combined with our innovative packaging approaches can result in the highest performance solution at the minimum cost, for your specific needs. Vapor compression cooling systems take advantage of the thermodynamic characteristics of refrigerants in order to cool a component or secondary coolant. Heat is absorbed from its source and rejected to a warmer exterior (typically the ambient environment). As an active thermal management solution, vapor compression cooling systems provide sub-ambient cooling. With the use of an appropriate refrigerant, compressor, and heat exchangers, a vapor compression refrigeration system provides a flexible, efficient means of active thermal management. The major components of a refrigeration system are the compressor, condenser, expansion valve, and evaporator. The compressor is the heart of a refrigerant system: it uses a small amount of energy to generate the necessary refrigerant flow and subsequent heat transfer as desired. 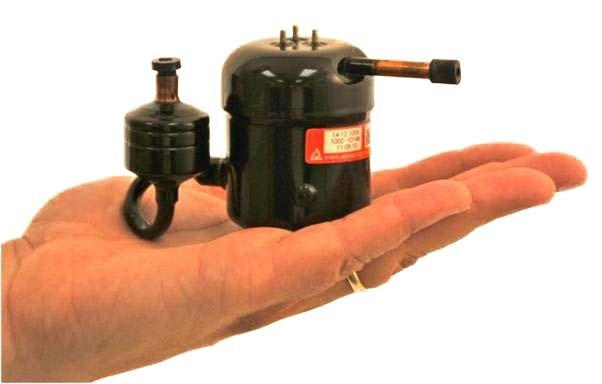 Aspen developed a miniature rotary compressor which efficiently generates a significant cooling capacity within a small volume. The compressor takes in low pressure refrigerant vapor and compresses it to a high pressure and temperature. The refrigerant undergoes an isothermal phase change (gas to liquid) and rejects heat to the ambient environment at a high pressure within the condenser. The refrigerant throttled to a low pressure and temperature (typically below ambient) through the expansion valve. Refrigerant enters the evaporator primarily as a liquid and again undergoes an isothermal phase change (this time from liquid to gas) as the evaporator absorbs heat from the environment. The refrigerant again enters the compressor as a low pressure vapor restarting the cycle. The refrigeration cycle is demonstrated in the figure below. 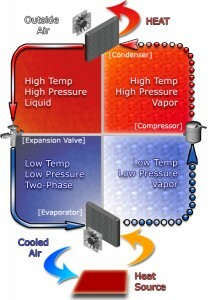 Vapor compression cooling systems are broken into the three categories below. For more details on these technologies and examples of similar systems we’ve built in the past, follow the links below. Air Conditioning Systems use recirculated air in a sealed environment as the cooling mechanism. Aspen’s refrigeration systems remove heat from the air which is circulated through the system to cool the heat source. Air conditioning systems are ideal for cooling bulk heat loads where minimal modification to the system is desired. Benefits: Least invasive solution, low cost. A Liquid Chiller System offer high heat transfer rates because the secondary fluid has a high thermal conductivity and specific heat. Liquid chiller systems can be quite compact because a pump circulates a coolant which offers high heat flux. Using a secondary coolant enables the size of heat exchangers to shrink, while thermal performance increases. A Liquid chiller is ideal for cooling high heat flux components and in applications where a solution must be rugged and reliable. A Direct Expansion System typically offer the highest heat transfer rates. A direct expansion system does not use a secondary coolant, instead the refrigerant absorbs heat directly at the heat source, minimizing the size and component count of the system. Direct expansion systems can integrate directly into a system and provide very high heat fluxes at the heat source.